OUR 11TH ISSUE “TATTOOS, ALT LIFESTYLE AND BODY MODS” IS OUT NOW! It’s FINALLY here! This is our second tattoo themed issue and after the incredible success and amazing submissions we got last year we couldn’t wait to put out another one! There’s some incredible Canadian talent in this publication, please share with your friends and family on social media and share your love of tattoos with us! 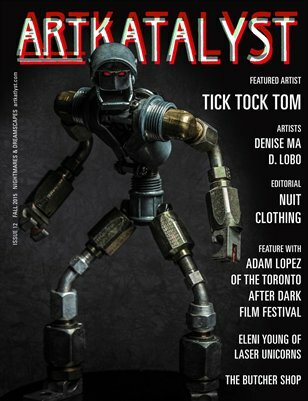 Tattoos, Alt Lifestyle and Body Mods is Art Katalyst Magazine’s 11th issue to date and second Tattoo issue. This special summer issue features some incredible Canadian talent with top artists in their respected fields. Posted in Uncategorized on June 26, 2015 by artkatalyst. We’ve got another incredible issue coming out soon for you guys! Our SECOND Tattoo issue will be released within the next few days! Look forward to some amazing talent like Riki-Kay Middleton featured in our first issue, Helena Darling from HFX Tattoos and the wonderful Katie Hollow! The official drop announcement will be posted on Facebook so keep an eye out! Posted in Uncategorized on June 23, 2015 by artkatalyst. More Photos from Liz Lam!! Posted in Uncategorized, Gallery format on May 20, 2015 by artkatalyst. Photos from the event are up! Images By Teri G. has just shared her photos with us of the festivities on May 2nd! If you have images you’d like to share with us to post on the website, email them to us at: art.katalyst@gmail.com! Posted in Uncategorized on May 14, 2015 by artkatalyst. On behalf of Art Katalyst’s management team Cate Hopkins and Danielle St Laurent, we would like to humbly thank everyone who came out to our One Year Anniversary Party this past Saturday at Mây Cafe and HUGE thanks to their incredible staff! Nicole Argentieri, Vicki Denstedt, Krista Poniatowski, Erica Johnston, Julian Gobert and Samantha Wu! Sadie Mae Glutz, Leelando Calrissian and El Toro! Karen Grosman, Kevin Jenkins, Hallowette, Don Quincy, Sean Chappell, Malinda Prudhomme and a special acknowledgement to Camille Porthouse Photography. Anchorsand, Amplify Apparel, Kindred’s Muze Photography, Kevin Jenkins, Adala Clothing, Malinda Prud’homme Art, Caitrionart Studios, Sarah Ve Couture, Half past zen, burfurtART, Rosie The Rebel Boutique – Toronto and Tanya Cheeks! Of course a HUGE thank you to all of our friends, past contributors and family for coming out and supporting us! We owe you all of our love! Posted in Uncategorized on May 7, 2015 by artkatalyst.